Starting from Fort Lauderdale is always our choice - such a lovely port. We stayed in Hollywood for 3 nights pre-cruise (see separate TripAdvisor review). Mardi Gras in New Orleans was the highlight of this cruise. We chose it because we had never been to New Orleans. What a spectacle! And the Reflection made the most of it, with purple, green and gold decorations, events for all cruisers and especially for Captains Club, and the music. I can&apos;t say enough about "Big Mike"&apos; musical director, band leader, trombone player par excellence! Also, Ray Brown Jr Jazz band, Danny Smart singer/guitar player, and Starlight Duo cello and violin were all fantastic. Celebrity CEO Linda joined us in New Orleans, and again in Grand Cayman to celebrate International Women&apos;s Day. She is very enthusiastic and delightful to meet. We received useful "Celebrate with the CEO" gifts in our cabin almost every day! The Reflection docked in NOLA starboard side to the dock, right at the end of Julia St. It was a short walk up it to the Bacchus parade route on Sunday night - perfect! And an easy walk the next day into the French Quarter. The parade is not visible from the ship because of the large Convention Centre and Riverwalk Outlets buildings at the dock. The Reflection has several large foyers for entertainment as well as numerous bars. Our only criticism was that the Ensemble lounge was always packed and we could not get a seat to listen to Ray Brown! The evening shows were all excellent, especially Broken Strings, Elysium, and Euphoria by the Reflection cast of singers, dancers and acrobats. We enjoyed a backstage tour with Emma, the lead singer/dancer. These kids have boundless energy! 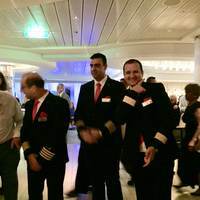 Starting from Fort Lauderdale is always our choice - such a lovely port. We stayed in Hollywood for 3 nights pre-cruise (see separate TripAdvisor review). Mardi Gras in New Orleans was the highlight of this cruise. We chose it because we had never been to New Orleans. What a spectacle! And the Reflection made the most of it, with purple, green and gold decorations, events for all cruisers and especially for Captains Club, and the music. 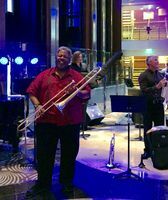 I can&apos;t say enough about "Big Mike"&apos; musical director, band leader, trombone player par excellence! Also, Ray Brown Jr Jazz band, Danny Smart singer/guitar player, and Starlight Duo cello and violin were all fantastic. Celebrity CEO Linda joined us in New Orleans, and again in Grand Cayman to celebrate International Women&apos;s Day. She is very enthusiastic and delightful to meet. We received useful "Celebrate with the CEO" gifts in our cabin almost every day! The Reflection docked in NOLA starboard side to the dock, right at the end of Julia St. It was a short walk up it to the Bacchus parade route on Sunday night - perfect! And an easy walk the next day into the French Quarter. The parade is not visible from the ship because of the large Convention Centre and Riverwalk Outlets buildings at the dock. The Reflection has several large foyers for entertainment as well as numerous bars. Our only criticism was that the Ensemble lounge was always packed and we could not get a seat to listen to Ray Brown! 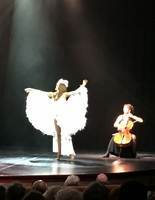 The evening shows were all excellent, especially Broken Strings, Elysium, and Euphoria by the Reflection cast of singers, dancers and acrobats. We enjoyed a backstage tour with Emma, the lead singer/dancer. These kids have boundless energy! Cabin was nicely designed, but we felt that use of space for cupboards could have been better. (Compared with Holland America. This is the ONLY thing that is better on Holland America). Our cabin steward Dedy was the best we have ever had. He brought us fruit, wine glasses, water and ice, every day and was very attentive. Walked down the road 10 minutes to the Sunset Bar. Great facilities for snorkeling right off the patio. Clean washrooms, showers, change area. good service from friendly waiters. $3 beers. We stayed at Hollywood Beach Suites before the cruise, just south of Ft Lauderdale. Beautiful groomed beach, warm water, long walks, sunsets. Lots of nice cafes and restaurants all along the seafront. 21/2 mile boardwalk for bike riding or walking. Exactly as advertised. Transport to Calico Jack&apos;s beach bar. Chairs, umbrella, 1 drink included, with restrooms, free internet. Bring your own snorkel, or rental available. Great for the morning. You could easily do this on your own fr half the price, and get out earlier before the crowds. Not enough seating for all guests. Very crowded. Got refund.